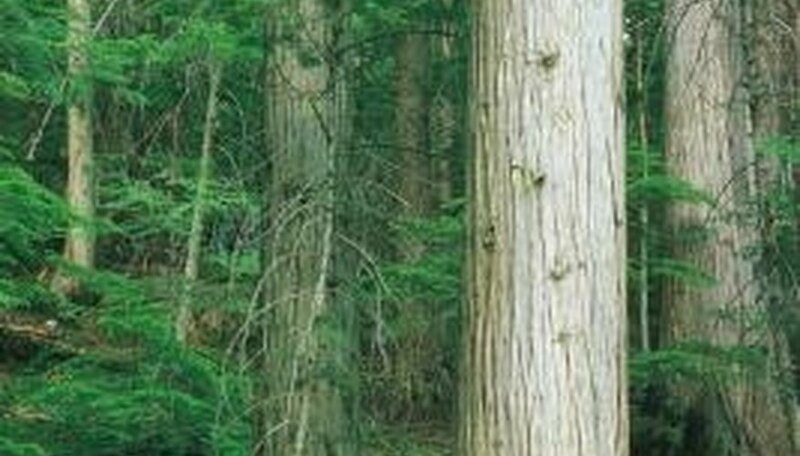 Cedar trees make lovely specimen trees and are often used as a wind screen. While cedar trees are generally hardy, they are susceptible to insect infestations and damaging disease that can cause them to die suddenly. Cedar trees injured or under drought stress are at an increased risk of insect infestations and disease development. Cedar bark beetles are a common pest of cedar trees and severe infestations can kill trees. This pest infests all cedar trees and trees may sustain damage from adult beetles or their larval form. Adult beetles are shiny and reddish-brown in color and the larvae are typical grublike worms. Adult bark beetles lay eggs in their chosen host tree, tunneling beneath the bark to hide their eggs which are laid in egg galleries. After hatching, the larvae feed beneath the bark of the cedar tree until they emerge as adults several months later. Cedar bark beetle larvae feed on the sapwood of cedar trees. Larvae produce a tunnel with a pattern on the internal wood of the host tree. Adult cedar bark beetles feed just underneath the bark of the host tree, as well as the stem and branches. Cedar trees foliage often turns colors quickly, going from green to yellow then on to red and brown before dying. By the time cedar tree foliage turns red, the beetles have already exited the host tree. Cedar trees typically die from heavy infestations of cedar bark beetles. Cedar incense rust is a common cause of cedar tree death. A fungal disease, cedar incense rust may produce light symptoms or it may cause the tree to appear sick for many years. The causal fungus remains within the tissues of the cedar tree for many years after infection. Incense cedar rust spreads by fungal spores carried on the wind or through water to infect trees in close proximity. Common hosts of this disease include incense cedar, pear, mountain ash, quince, hawthorn and apple. Incense cedar rust causes pustules of red and orange to develop on host-tree foliage. Trees may also have trunk swellings, and branches may take on a witches'-broom appearance. Heavy infection may cause deformation in the crown of the cedar tree, as well as black fruiting bodies of fungal spores on tree bark and foliage. Cedar trees may live for years with this fungal disease or they may develop a severe infection and die. While this disease is not usually lethal in healthy trees, trees under stress from drought or winter injury are at an increased risk of developing a severe infection from incense cedar rust fungi.